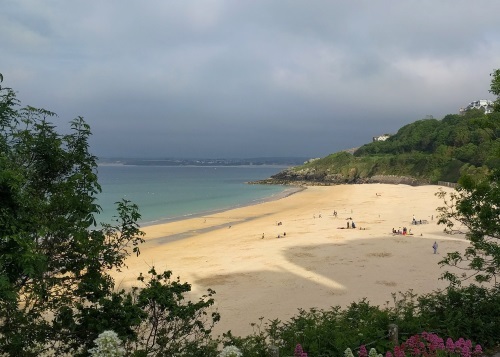 The origins and identity of St Ia, the patron saint of St Ives, Cornwall (Porthye/Sancta Ya in 1284, Porthia in 1291), has rarely been seriously investigated, beyond noting the existence of late medieval legends that claim she arrived in Cornwall c. 500 AD from Ireland on a leaf. 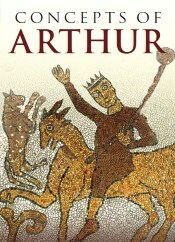 (1) However, recent work suggests that St Ia may be rather more interesting than she at first appears, perhaps having been originally a Byzantine saint whose cult arrived in south-western Britain in the fifth or sixth century, at the same time as the exceptional quantities of imported eastern Mediterranean goods known from sites such as Tintagel and Gwithian (St Ives Bay). 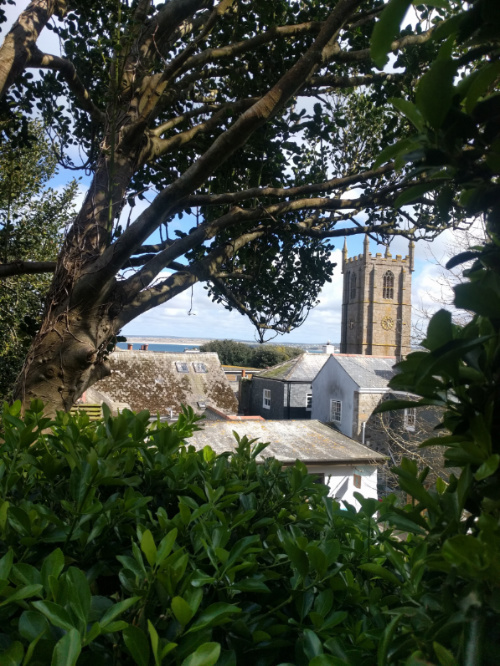 The fifteenth-century church of St Ia at St Ives, Cornwall, looking across the roofs from the Barbara Hepworth Sculpture Garden, with the opposite side of St Ives Bay visible in the background, an area that has seen notable finds of imported eastern Mediterranean pottery of the fifth to sixth centuries (image: C. R. Green). Such a situation is, of course, most intriguing. 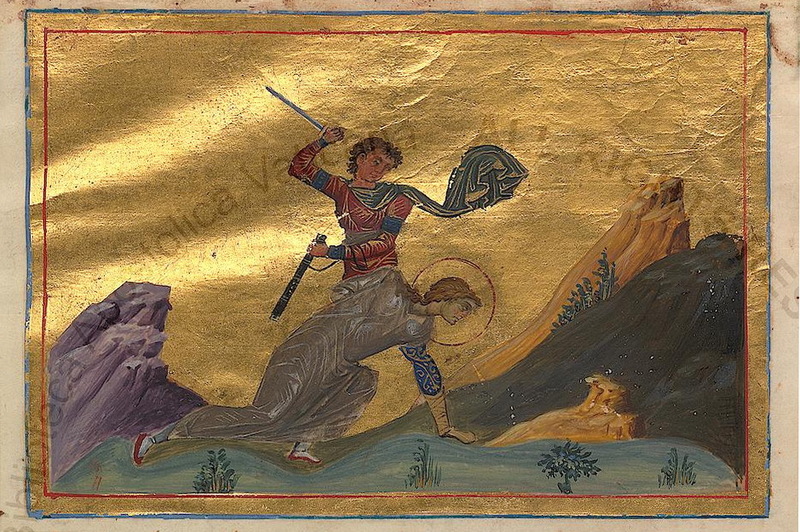 On the one hand we have an obscure female saint in Cornwall named Ia about whom only very late, untrustworthy legends survive, and on the other hand we have a female St Ia who was martyred in fourth-century Persia and venerated in the eastern Mediterranean, with her shrine being next to the Golden Gate at the imperial capital and renovated with care by the Emperor Justinian himself in the sixth century. In this light, it certainly seems permissible to wonder whether the enigmatic Cornish St Ia and the Early Byzantine St Ia might not, in fact, be one and the same, especially given that they are both female saints. So, how credible is it that a Late Antique eastern Mediterranean cult of a female St Ia might have been transferred to south-western Britain? A Byzantine depiction of the martyrdom of St Ia of Persia, from the late tenth-century Menologion of Basil II, MS Vat.gr.1613 (image: Wikimedia Commons). 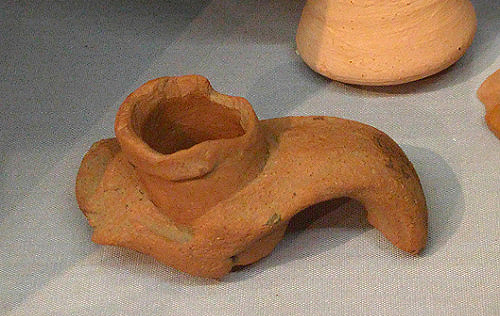 A fragment of an Early Byzantine wine amphora found at the important fifth- to sixth-century site of Tintagel, Cornwall (image: C. R. Green). A map of Mediterranean imports and early Christian sites of the fifth to seventh centuries in and around St Ives Bay, Cornwall. St Ives lies at the western end of the bay, with the Hayle Estuary at its centre (Phillack or Egloshayle is located just north of the eastern branch of the estuary) and Gwithian on the Red River at its north-eastern end; click the image or here for a larger version of this map or go here for a zoomable version of the base map. Finds of Mediterranean imports are indicated by a red dot (with the debated finds from Hellesvean, St Ives, mentioned in fn. 8, indicated by a red ring), probable early chapel/church sites by small crosses (see fn. 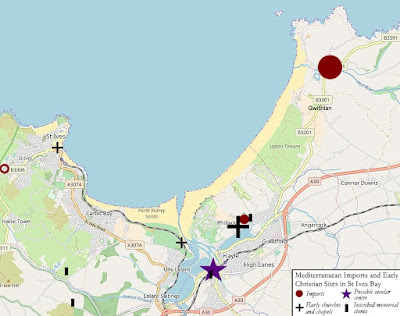 9 on Lelant), the likely ecclesiastical centre at Phillack by a large cross, and the suggested secular centre at Carnsew hillfort, Hayle, by a purple star; early Christian inscribed memorial stones are also shown, depicted by an upright black rectangle (image: C. R. Green, on a base map from OpenStreetMap, CC BY-SA 2.0). The distribution of Mediterranean imports in fifth- and sixth-century western Britain and Ireland, after E. Campbell, Continental and Mediterranean Imports to Atlantic Britain and Ireland, AD 400–800, Council for British Archaeology Research Report 157 (York, 2007), and A. M. Kelly, 'The Discovery of Phocaean Red Slip Ware (PRSW) Form 3 and Bii ware (LR1 amphorae) on sites in Ireland - an analysis within a broader framework', Proceedings Of The Royal Irish Academy, 110 (2010), 35–88 (image: C. R. Green). 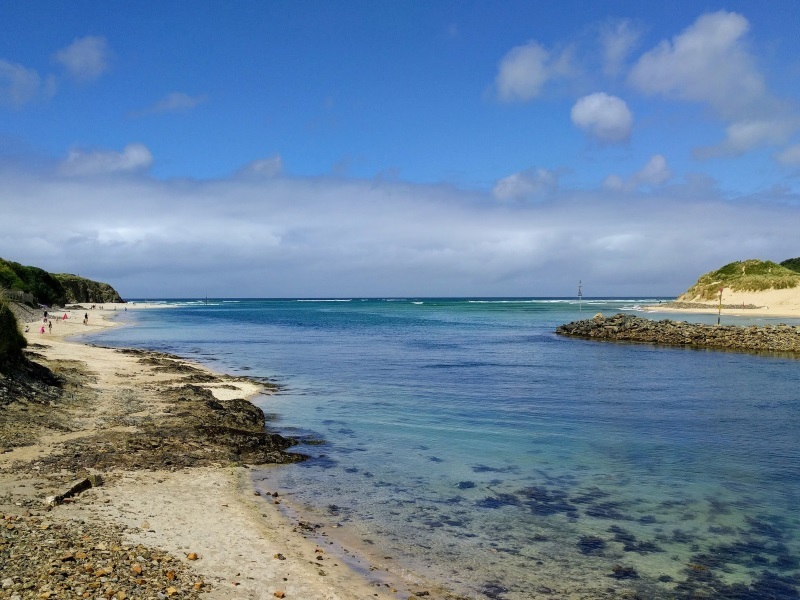 The entrance to the Hayle Estuary, with Porthkidney Sands, Lelant, on the left and Hayle beach on the right (image: C. R. Green). All told, then, it would thus seem clear that there is at least a case to be made for identifying the obscure St Ia of St Ives, Cornwall, with the Byzantine St Ia of Persia (a martyr whose shrine by the Golden Gate at Constantinople was sumptuously restored by the emperor Justinian in the sixth century), rather than seeing her as an otherwise unknown female saint with a coincidentally identical name, with this cult of St Ia perhaps having been introduced to western Cornwall in the later fifth or sixth centuries. Certainly the shared name, the fact that they are both female saints, and the sheer quantity of the evidence now available for contact between Cornwall/western Britain and the eastern Mediterranean in the fifth and sixth centuries—including from what appears to be an important Christian site in St Ives Bay itself—are all at the very least suggestive, as is the potential for there having been other imported cults elsewhere in Cornwall and western Britain. 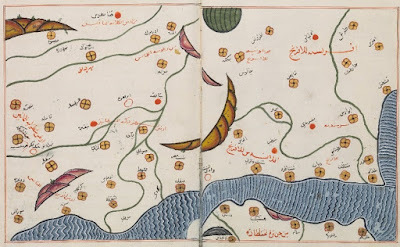 Whilst a coincidence cannot, of course, be ruled out, the possibility of an origin for the Cornish St Ia in the Byzantine eastern Mediterranean would consequently seem to deserve at least some serious consideration. 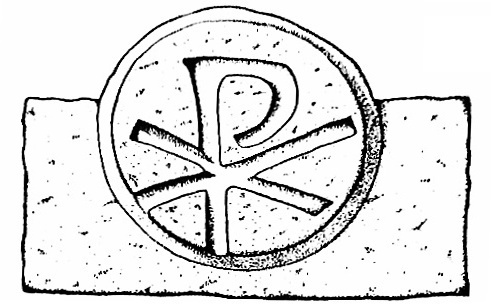 Drawing of the probably fifth-century AD small Chi-Rho stone from the porch gable of the church at Phillack (or Egloshayle), Hayle, which has been compared to early Chi-Rhos from the continent and eastern Mediterranean, e.g. S. M. Pearce, South-Western Britain in the Early Middle Ages (Leicester, 2004), p. 244, and C. Thomas, And Shall These Mute Stones Speak? Post-Roman Inscriptions in Western Britain (Cardiff 1994), pp. 199–200; a photograph of the stone can be seen here (photo: C. R. Green, from an original drawing by Charles Thomas in the Royal Cornwall Museum, Truro). Hayle Beach seen across St Ives Bay from Porthminster beach, St Ives; for a larger version of this image click here. Interestingly, a report from the late nineteenth century notes that a medieval chapel and two burials were exposed at Porthminster, St Ives, by the shifting sands in c. 1870, but were then buried again; certainly the presence of a chapel and burials might help explain the 'minster' element in the name here, which is first recorded in 1301 (image: C. R. Green). 1. N. Orme, The Saints of Cornwall (Oxford, 2000), p. 144; O. J. Padel, Cornish Place-Names (Penzance, 1988), p. 100. Note, the correct form of the saint's name is Ia, not Ive or similar, as found in the modern English form of the place-name: the intrusive -v- is non-original and probably emerged under the influence of the unrelated place-names St Ive in eastern Cornwall (Sanctus Ivo in 1201) and/or St Ives in Cambridgeshire (Sancto Ivo de Slepe in 1110), both of which reference a distinct male saint named St Ivo; see further Padel, Cornish Place-Names, p. 100, and D. Mills, A Dictionary of British Place-Names (Oxford, 2011), p. 401; V. Watts, Cambridge Dictionary of English Place-Names (Cambridge, 2004), p. 520..
2. See especially N. Orme, The Saints of Cornwall (Oxford, 2000), generally on the claimed 'Irish' origins of Cornish saints, of which he is sceptical; he discusses St Ia on pp. 144–5 and St Gwinear on pp. 136–8. See also P. C. Bartrum, A Welsh Classical Dictionary (Cardiff, 1993), pp. 426–7, and G. H. Doble, The Saints of Cornwall: Part One, Saints of the Land's End District (Felinfach, 1997), pp. 89–94, on St Ia. 3. K. R. Dark, Britain and the End of the Roman Empire (Stroud, 2000), p. 163; K. R. Dark, 'Globalizing late antiquity: models, metaphors and the realities of long-distance trade and diplomacy', in A. Harris (ed. ), Incipient Globalisation? Long-Distance Contacts in the Sixth Century (Oxford, 2007), pp. 3–14 at p. 7. 4. Procopius, Buildings, I.ix.16–17; the text of St Ia's passion is printed in H. Delehaye, Les versions grecques des actes des martyrs Persans sous Sapor II (Paris, 1907), vol. II, pp. 453–73. 5. See, for example, M. Fulford, 'Byzantium and Britain: a Mediterranean perspective on post-Roman Mediterranean imports in western Britain and Ireland', Medieval Archaeology, 33 (1989), 1–6; A. Harris, Byzantium, Britain and the West: the Archaeology of Cultural Identity, AD 400–650 (Stroud, 2003); E. Campbell, Continental and Mediterranean Imports to Atlantic Britain and Ireland, AD 400–800, Council for British Archaeology Research Report 157 (York, 2007); A. Harris, 'Britain and China at opposite ends of the world? 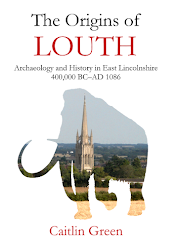 Archaeological methodology and long-distance contacts in the sixth century', in A. Harris (ed. ), Incipient Globalisation? Long-Distance Contacts in the Sixth Century (Oxford, 2007), pp. 91–104; E. Campbell & C. Bowles, 'Byzantine trade to the edge of the world: Mediterranean pottery imports to Atlantic Britain in the 6th century', in M. M. Mango (ed. ), Byzantine Trade, 4th-12th Centuries: The Archaeology of Local, Regional and International Exchange (Farnham, 2009), pp. 297–314; T. M. Charles-Edwards, Wales and the Britons, 350–1064 (Oxford, 2013), pp. 222–3; M. Duggan, 'Ceramic imports to Britain and the Atlantic Seaboard in the fifth century and beyond', Internet Archaeology, 41 (2016), online at http://intarch.ac.uk/journal/issue41/3/index.html; S. Moorhead, 'Early Byzantine copper coins found in Britain – a review in light of new finds recorded with the Portable Antiquities Scheme', in O. Tekin (ed. ), Ancient History, Numismatics and Epigraphy in the Mediterranean World (Istanbul, 2009), pp. 263–74; W. Anderson, 'Menas flasks in the West: pilgrimage and trade at the end of antiquity', Ancient West and East, 6 (2007), 221–43; and S. Bangert, 'Menas ampullae: a case study of long-distance contacts', in A. Harris (ed. ), Incipient Globalization? Long-Distance Contacts in the Sixth Century (Oxford, 2007), pp. 27–33. 6. 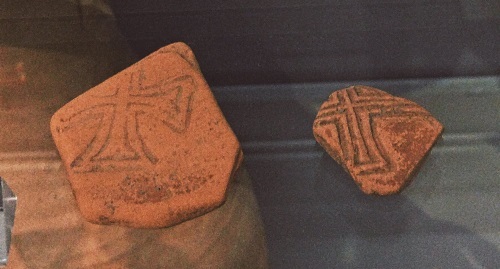 K. A. Hemer et al, 'Evidence of early medieval trade and migration between Wales and the Mediterranean Sea region', Journal of Archaeological Science, 40 (2013), 2352–59. See further C. R. Green, 'Some oxygen isotope evidence for long-distance migration to Britain from North Africa & southern Iberia, c. 1100 BC–AD 800', 24 October 2015, blog post, online at http://www.caitlingreen.org/2015/10/oxygen-isotope-evidence.html, and K. A. Hemer et al, 'No Man is an island: evidence of pre-Viking Age migration to the Isle of Man', Journal of Archaeological Science, 52 (2014), 242–9. 7. 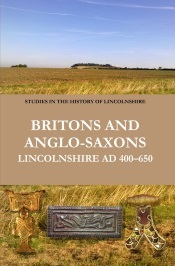 For the reference to an early seventh-century ship visiting Britain, see Leontius, Life of St John the Almsgiver, chapter 10; C. Snyder, An Age of Tyrants: Britain and the Britons, AD 400–600 (Stroud, 1998), p. 152; C. J. Salter, 'Early tin extraction in the south-west of England: a resource for Mediterranean metalworkers of late antiquity', in M. M. Mango (ed. ), Byzantine Trade, 4th–12th Centuries: The Archaeology of Local, Regional and International Exchange (Farnham, 2009), pp. 315–22 at p. 320; M. M. Mango, 'Tracking Byzantine silver and copper metalware, 4th–12th centuries', in M. M. Mango (ed. ), Byzantine Trade, 4th-12th Centuries: The Archaeology of Local, Regional and International Exchange (Farnham, 2009), pp. 221–36 at p. 223. For the Penmachno stone, see T. M. Charles-Edwards, Wales and the Britons, 350–1064 (Oxford, 2013), pp. 234–8, quotations at p. 235 and 238. 8. For the Gwithian site, see now J. 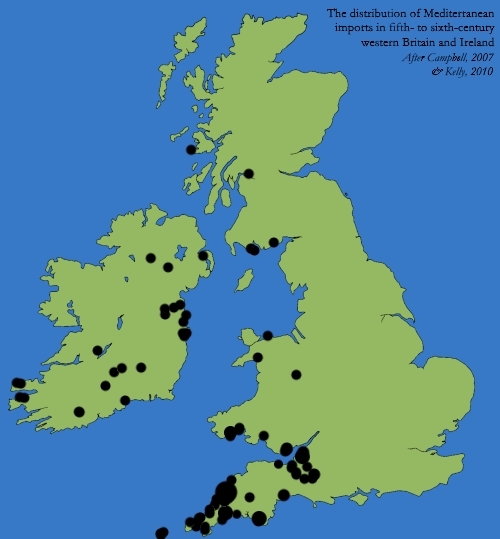 A. Nowakowski et al, 'Return to Gwithian: shifting the sands of time', Cornish Archaeology, 46 (2007), 13–76, and I. Tompsett, Social Dynamics in South-West England AD 350–1150: An Exploration of Maritime Oriented Identity in the Atlantic Approaches and Western Channel Region (University of Nottingham PhD Thesis, 2012), pp. 360–82. Note, there are confused reports of Mediterranean imports from just to the south of St Ives proper at Hellesvean, St Ives; however, the circumstances of the excavations, first undertaken in the 1920s, mean that they need to be treated with caution and Ewan Campbell rejects them on the grounds that they we cannot be certain that the finds ascribed to Hellesvean don't come from other sites: E. Campbell, Imported Material in Atlantic Britain and Ireland c.AD 400–800, 2007, project archive, online at http://archaeologydataservice.ac.uk/archives/view/campbell_cba_2007/index.cfm, sites database. For what it is worth, claimed post-Roman Mediterranean imports from Hellesvean, St Ives, include "5 sherds of Aii imported Mediterranean ware [i.e. African Red Slip Ware from the Carthage region]" (G. Hutchinson, 'The bar-lug pottery of Cornwall', Cornish Archaeology, 18 (1979), 81–103 at p. 96) and a possible sherd from a Biii amphora (Cornwall and Scilly Historic Environment Record, PRN 31135.02). 9. C. Thomas, A Provisional List of Imported Pottery in Post-Roman Western Britain and Ireland, Institute of Cornish Studies Special Report No. 7 (Redruth 1981), p. 6; C. Thomas, 'The context of Tintagel. A new model for the diffusion of post-Roman Mediterranean imports', Cornish Archaeology, 27 (1988), 7–25 at p. 22; C. Thomas, And Shall These Mute Stones Speak? Post-Roman Inscriptions in Western Britain (Cardiff 1994), pp. 197–201; E. Okasha, Corpus of Early Christian Inscribed Stones of South-west Britain (Leicester, 2003), pp. 205–07; S. M. Pearce, South-Western Britain in the Early Middle Ages (Leicester, 2004), pp. 12, 149–51; S. Turner, 'Making a Christian landscape: early medieval Cornwall', in M. Carver (ed. ), The Cross Goes North: Processes of Conversion in Northern Europe, 300–1300 (Woodbridge, 2003), pp. 171–94 at pp. 175–6; S. Turner, Making a Christian Landscape: How Christianity Shaped the Countryside in Early-Medieval Cornwall, Devon and Wessex (Exeter, 2006), pp. 35–6; and I. Tompsett, Social Dynamics in South-West England AD 350–1150: An Exploration of Maritime Oriented Identity in the Atlantic Approaches and Western Channel Region (University of Nottingham PhD Thesis, 2012), pp. 39, 132, 378–81. On the potential important secondary centre of power for the Dumnonian kingdom located in the Hayle Estuary, see C. Thomas, 'The context of Tintagel. A new model for the diffusion of post-Roman Mediterranean imports', Cornish Archaeology, 27 (1988), 7–25, especially p. 16 and fig. 3 (p. 17). 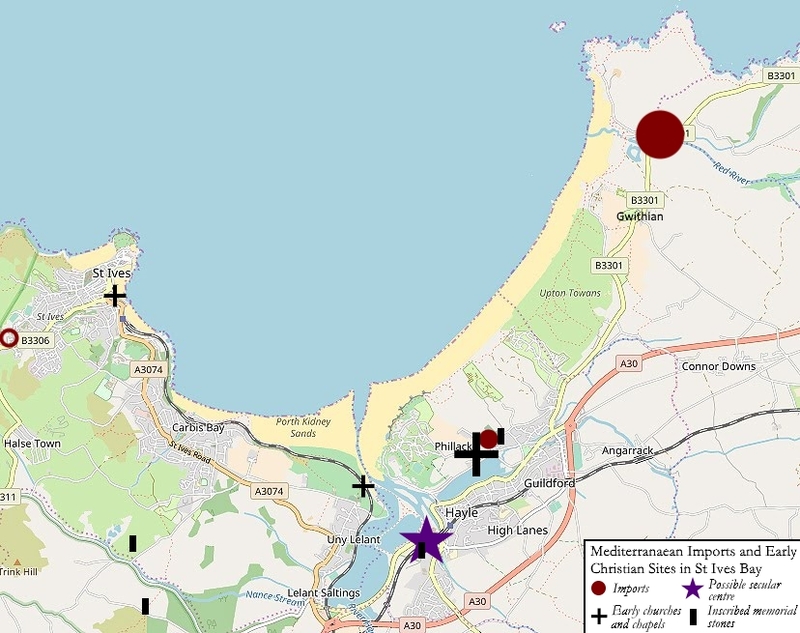 Thomas suggests that this secular focus was located at the 'small coastal fort of Carnsew commanding the Hayle inlet,' which is 'unexplored, hardly recorded but suggestively placed' (p. 16); in this context, it is worth noting that the small multivallate hillfort at Carnsew, Hayle, was the site of an antiquarian find of an early post-Roman inscribed memorial stone and cist grave that Thomas dates to the fifth century ('The context of Tintagel', p. 21; And Shall These Mute Stones Speak?, pp. 191–3), and moreover occupies a strategically significant controlling position on a low but prominent small hill overlooking the Hayle Estuary. Another potentially notable early site on the Hayle Estuary is at Lelant, where a probably fourth- or fifth-century AD burial site and a chapel were uncovered in the late nineteenth century, see I. Tompsett, Social Dynamics in South-West England AD 350–1150: An Exploration of Maritime Oriented Identity in the Atlantic Approaches and Western Channel Region (University of Nottingham PhD Thesis, 2012), pp. 134 (fig. 45), 375 (fig. 201), and 379–81; C. Noall, 'Nineteenth-Century discoveries at Lelant', Cornish Archaeology, 3 (1964), 34–6; Cornwall & Scilly Historic Environment Record no. 31061; C. Thomas, And Shall These Mute Stones Speak? Post-Roman Inscriptions in Western Britain (Cardiff 1994), p. 198, fig. 12.1. 10. K. R. Dark, Britain and the End of the Roman Empire (Stroud, 2000), p. 163; K. R. Dark, 'Globalizing late antiquity: models, metaphors and the realities of long-distance trade and diplomacy', in A. Harris (ed. ), Incipient Globalisation? Long-Distance Contacts in the Sixth Century (Oxford, 2007), pp. 3–14 at p. 7; A. Harris, Byzantium, Britain and the West: the Archaeology of Cultural Identity, AD 400–650 (Stroud, 2003), pp. 159–60; S. M. Pearce, South-Western Britain in the Early Middle Ages (Leicester, 2004), p. 244. 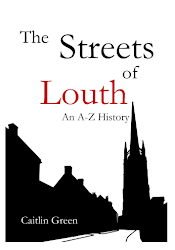 On St Just, it is worth noting that he, like St Ia, is often described as 'obscure' and a saint about whom 'nothing is known' (N. Orme, The Saints of Cornwall (Oxford, 2000), p. 155; V. Watts, Cambridge Dictionary of English Place-Names (Cambridge, 2004), p. 520).